· Mix flour, protein, cinnamon, allspice, nutmeg, baking soda, and salt together. 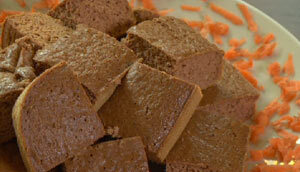 · In a separate bowl, mix egg whites, splenda, carrot baby food, and water together. · Slowly add the dry mixture to the wet. · Spray a 9×9 pan with non-stick cooking spray. 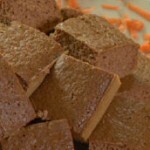 · Cool, slice into squares, and enjoy!